In the chill and glomming of Ohio Stadium in November, Michigan athletic director Warde Manuel likely looked at the scoreboard a time or two in the final moments of the 62-39 loss to Ohio State and sighed a seventh sigh. He’s a smart man and knew what was coming. He’d get back to Ann Arbor and everyone from the university president to the head of the marching band would want to know when the Wolverines would beat the Buckeyes again. When you lose seven straight to your archrival, and you are the boss, people tend to have questions. And you might suspect Manuel passed along their concerns to Jim Harbaugh, his head coach and khakis king, who made $7.5 million in 2018 with the primary goal, above all else, of beating Ohio State. What was Harbaugh going to do to make it better? Earlier this week, the coach gave us a hint. While he was in town recruiting, amazed at what he saw on tape, Harbaugh offered a scholarship to quarterback Isaiah Marshall of McArthur Academy in Southfield, Mich.
Isaiah Marshall is in seventh-grade. He is 13 years old. He is 5-foot-8 and 156 pounds (without his backpack). His major food groups are soda, Doritos and Pop-Tarts. Marshall’s father and uncle are football coaches at Southfield High, a school Isaiah isn’t even scheduled to attend until 2020. And let’s take it one step further: If Isaiah accepts the scholarship, he wouldn’t take his first snap with the Maze and Blue until September 2024, by which time Michigan’s losing streak to the Buckeyes might be 12 and Harbaugh would likely be back in the NFL, on television or in some GAP ad. Isaiah has been a conversation piece since his dad let him work with the football team. Without a middle school program, he plays on a youth team that has won national championships and finished third this season. People have taken note of athletic ability and made the necessary extrapolations about what me might look like in five years. The kid’s DNA is powerful. His father played at Northwestern and won a Big Ten title there in 2000. Hs grandfather played football. Brian cousin, Lawrence, played defensive line at Michigan. Isaiah’s mom played basketball at DePaul and her dad played football at Illinois. His parents’ cousin, Robert Thomas, played five seasons with the Dallas Cowboys. 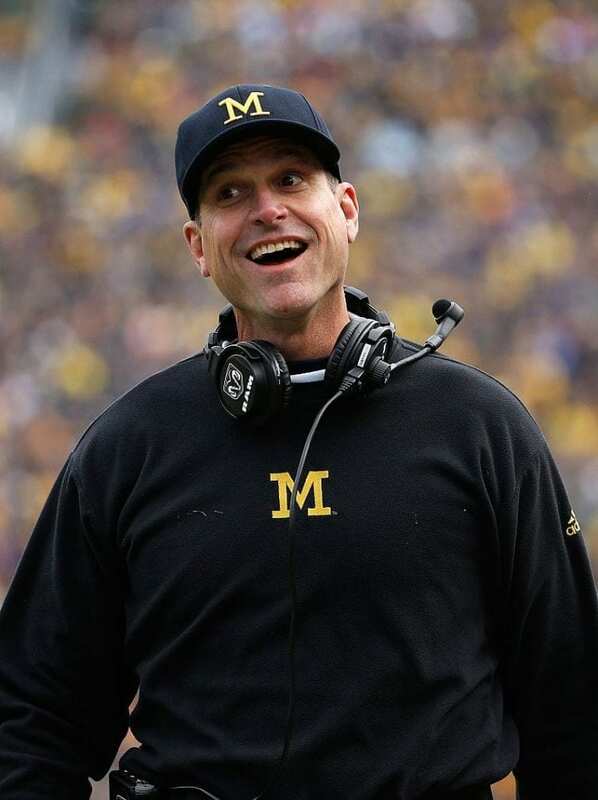 Apparently, Harbaugh saw another Dennis Franklin, Elvis Grbac or, um, Jim Harbaugh. We’d mention Tom Brady, but Michigan didn’t even see Tom Brady when he played there. By the way, Michigan did not beat Michigan State, Alabama, Clemson, Georgia or Ohio State to the punch. The Wolverines were the first and only one in on the kid. Heck, Brian Marshall told reporters that he was pumped up just to be taking to Harbaugh about his kid. You can imagine how he felt when Harbaugh offered him the entrée. 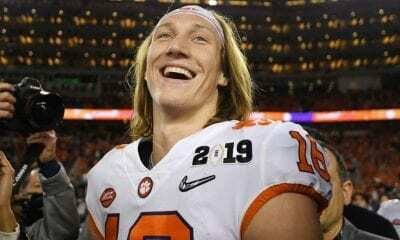 “He (Harbaugh) reviewed a lot of his (Isaiah) tape, broke it down, critiqued it and made the offer,” said Brian Marshall. Recruiting kids Marshall’s age is not as unusual as you might think. Rivals.com was putting up recruiting profiles of sixth graders as early as 2015. And it’s not illegal. Guidelines are drawn on the NCAA website. It says its technically not against the rules for all sports except lacrosse and softball. If a recruit calls a college coach, the coach is allowed to speak to them no matter how old he is. The coach is allowed to request video and review them. And if interested, a verbal scholarship, which is non-binding, can be extended. When he coached at Southern California, Lane Kiffin offered a 13-year-old QB, David Sills V, after watching one clip of the kid in 2010. 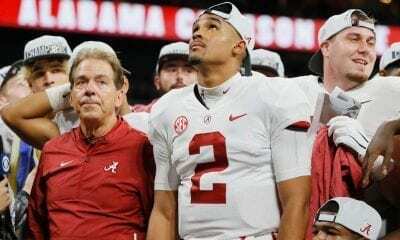 Sills committed but never played for Kiffin. But he played wide receiver at West Virginia. This season, Kiffin, now the coach at Florida Atlantic, offered a scholarship to the 11-year-old son of former USC Heisman Trophy winner, Matt Leinart. The year before Kiffin offered seventh-grader Kaden Martin, the son of USC offensive coordinator, Tee Martin. Presumably, like Michigan finally beating Ohio State.